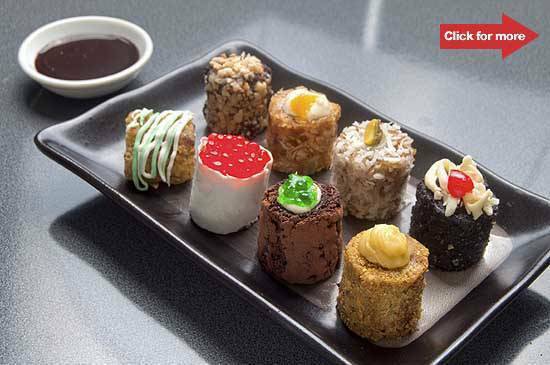 Something new to nibble on: pretty sushi and maki-shaped desserts. Sweet sushi suprises (box of 4, P165; box of 8, P250). Click for more photos. On our radar this month: sushi and maki-shaped desserts from Pink Wasabi. 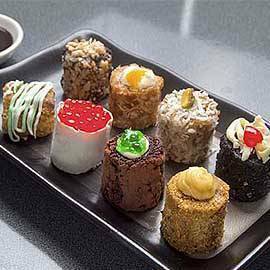 Dubbed "kashi makis," these bite-sized cakes created by entrepreneurial friends Cindie Cheng, Jo-an Yu and pastry chef Anna Chua, are delicately rolled and shaped like sushi and maki and come in chocolate and fruity flavors. Putting an innovative twist to the saturated dessert market filled with brownies and cupcakes, Pink Wasabi’s pretty confections come in 8 flavors, 4 of which are tea-infused: Oolong Berry, infused with Oolong tea; Lemony P, made with lemon tea; the Midnight Mint has peppermint tea, and the White Matcha is infused with green tea. The nibble-sized cakes are surprisingly devoid of the cloying sweetness associated with desserts. Chocolate lovers will like the Midnight Mint, which is dusted with dark chocolate powder and made with Belgian chocolates but the strong peppermint flavors--which offers a minty kick--may be an acquired taste. The Oolong Berry can be addictive even for non-strawberry fans: the strawberry ganache filling is wrapped in a light almond cake and rolled in white chocolate and topped with playful gelatin shaped to look like salmon roe. The Momo Crunch is light and fruity, with toasted almonds lending texture to the light sweet peach flavors. Other flavors include Cookie Kiss, Chantilly creme enveloped in dark chocolate cake; Choco Locco, nut-covered chocolate cake with Belgian chocolate at the center; White Matcha, white Belgian chocolate with hints of green tea and drizzled with white chocolate; and Coconut Dream, coconut flake-covered pistachio roulade with white chocolate ganache inside. Pink Wasabi introduced their desserts to the weekend market crowd via Mercato Centrale in Bonifacio Global City in 2010, but market their goodies mainly through word of mouth and through Facebook. Available in boxes of 4 (P165) and 8 (P250), Pink Wasabi’s kashi makis are also available in Octoboy in Tomas Morato and at the Quezon City Sports Club. For orders, e-mail mypinkwasabi@gmail.com or call 922-2588, (0905)265-4418.